So Omer my good friend and main Saga adversary managed to get a copy of Gripping Beasts Age Of The Wolf, a new campaign system for SAGA, which we have both been eagerly awaiting. My Four point warband for Age Of The Wolf. Made up of some of my newly painted Irish figures. 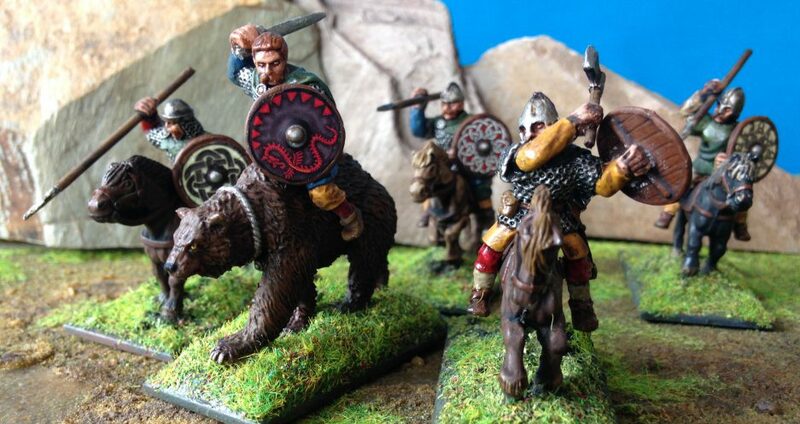 Lead by Máirtín Mahon (Warlike Bear), Scourge of the Jomsvikings. The first thing I really liked about AOTW was the fleshing out of your Warlord who is named and given a motivation which you choose then 2 traits and 1 extra special rule which are randomly generated using dice making him a lot more varied and fun. AOTW brings more of an ongoing story into your SAGA game something myself and Omer being lovers of stories myths and legends have always incorporated into our games anyway. A game called SAGA just begs the players to create one. I liked how each season was also made up of randomly generated scenarios which are also affected by your style of play. Whether or not you chose to raid defend or campaign. As are your rewards of land wealth and reputation. Land, wealth and reputation also affect how many units of men of each type you can have in your warband. You also roll for fate at the end of a campaign as the name suggests the out come of this roll can be good or bad. This lends a lot of both diversity and tactics to the campaign giving the game play a lot of depth. AOTW Roster Sheet available to download from the Gripping Beast website. My Irish forces are made up of a mixture of figures from Footsore Miniatures, Crusader Miniatures and Warlord Games. For an in depth technical review of how AOTW works check out Lee Brady’s excellent blog Harold’s Revenge. There is also of course a great thread on the Studio Tomahawk Forum. Check out Omers facebook page CAN’T SLEEP MUST PAINT. Thanks to Brad of Suppressing Fire for picking up AOTW from Salute as neither Omer or I were able to attend. Very excited to find out more about the Age Of The Wolf a new Viking Age campaign system for Saga from Gripping Beast more details to be announced next week ! Age Of The Wolf will be a complete system for 2 or more players with each player leading a 4 point war band, (from any of the dark age factions), in an ongoing struggle to gain land and wealth and build reputation. Contesting the ultimate prize of becoming king. It will hopefully be released at SALUTE.